Can You Solve the Mystery Through the Author’s Clues? Recently I’ve noticed that I am not solving a lot of the crimes in the Cozy Mystery books I read. For some reason, the person who committed the crime comes as a total surprise to me. I sometimes find myself making a conscious decision to solve the mystery using all of the clues the sleuth has provided (through the author). However, I have to admit that a lot of the time the culprit is someone I absolutely had no idea would be the person responsible for the awful deed. Yikes! Am I losing my Cozy Mystery deducing skills, or am I just getting lazy? This got me thinking >>> surely I’m not the only one who sometimes is totally surprised by the culprit. Other Cozy Mystery readers must have the same thing going-on. I should add that I’m not talking about the Cozies where not only do you know the culprit of the crime, but you also know the victim five or six chapters before the crime was committed. I’m sure lots (if not all!) of you have read a few of those books! (Yikes! We’re not all clairvoyants, yet there are some books that leave us feeling like we are!) Nor am I talking about the mysteries where a character is introduced at the very end of the book, since the author wants that character to be the “surprise” culprit. 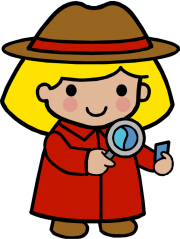 I’m talking about the Cozy Mysteries where you go along with the sleuth, as she/he sleuths around the community. You actually pay attention to all of the information the sleuth becomes aware of, and you try to figure out, along with the sleuth, who was responsible for the crime. It bothers me that I’m just not very good at this, and I wonder if everyone else is! Is this a skill you lose if you read too many Cozy Mysteries? Are the Cozy Mystery authors not providing enough clues to make the mystery solvable? Or, is it just me? Are you actually able to solve the mystery through all of the author’s clues? Please leave a comment if you are able to solve most of the mysteries you read before the author does the big reveal. Also, leave a comment if you are like me, and find this skill something which you don’t have! Thanks! It is rare that I’m able to solve the mystery ahead of time and I’m ok with it! I derive the most enjoyment from the character studies that are infused through the majority of the cozies I read. I guess that is why I love reading series as opposed to stand-alone books. then realize, its a different person and do I feel bad? No, actually that’s why I love mysteries….I can think I know; but too many red herrings…smile. I love mysteries, but not thriller as they are too scary. laughter……just the cozy, madam. Been even reading some of the Kindle mysteries….and some of them are quite good…..but if I am right about who did it in the middle of the book….then you don’t have to go to the end…..that depresses me. laughter. Good mystery………but when the kids got off the bus from school, had to wait to read it after they were in bed and the house quiet….My oldest son came in and asked if I knew who did it, and why not go to the end and PEEK….I looked at him and smiled and said “that was cheating!” and it would spoil me trying to decide who did it…..well a few days later at the dinner table, he told me who did and laughed….I was so disappointed and explained why that was a no…no…but sometime later he was reading one of his favorite books and I think he learned his lesson when one of his friends told him he didn’t need to read the book as the butler did it……I laughed when he told me, and asked how he liked it……So that’s why I like to enjoy the story and wait until I come to the end. smile. If the author is being “fair” — and showing us all the clues that the sleuth has — WITH the same ability to make connections — then yes, I can usually figure it out. Or alternately — the clue is described in great detail — “She looked at the art deco dragonfly earring set with opals and knew where she’d seen its partner..” — um… but WE don’t know who was wearing the missing earring — so — again — deserted location, no cellphone, etc….. Sometimes we have all the clues jumping up & down & waving flags in our faces — and wonder why the sleuth doesn’t notice — that drives me crazy too. And then of course there are some “tells” that have to do with the way a novel is structured that would not correlate to real life — for example — a sleuth owns a retail establishment — the author cannot detail each customer who walks into that store in the course of a given day and describe what each of these people bought — or said — or didn’t buy, etc. — there wouldn’t be enough room in a book plus 99% of this would be irrelevant to the story. So usually the only customers described are — recurring characters (who usually, but not always, have something to say to move the story forward — like — did you hear about the murder? my cousin who works in the police department says….) — or else — if a total stranger suddenly gets significant print time — they’ve got to be either — a new love interest — or the murderer! Of course in real life you don’t have that “highlighting” going on — people come & people go & you have no way of knowing which of them are important to the mystery. And then of course there’s the “who is the least likely person to have committed the crime” — and you know that’s gonna be your murderer — even if you have no idea WHY this person would be the murderer, you know they’re the one. I find that disappointing too. I think the most annoying thing was in the first chapter of a book, a minor service employee was very helpful to the main characters — and I thought — oh well — he’s gonna have to be the murderer.. .sigh….. now there was no reason why that character would have any connection with the victim or any motive for the crime or ANYTHING AT ALL to do with the murder — until the last chapter — when lo & behold — this minor service employee — suddenly turned out to be major crime kingpin — and guess what — he was the murderer… sigh……………. Margaret, yikes! You listed one of the scenarios that simply annoys me to no end: I absolutely cringe when the sleuth sees something the reader doesn’t. For some reason, I think it’s sort of cheating. I mean, the mystery has just been solved, so why are we still here? Luckily, I haven’t read any of the “they’re not really dead” plots. Agatha Christie did that so well, it would be difficult to believe anyone could do it better, or even equally well. P.S. >>> I love those old Ellery Queen television episodes! This is a series I would have loved to see continue on and on. I am going to have to watch them again. I had almost forgotten about Jim Hutton turning to the camera and reviewing the clues! Loved that! Margaret, I loved your post! You’ve certainly nailed the scenarios that irritate me and probably many of us. You’re quite a good writer, displaying elements of humor and imagination. Maybe you should try writing a mystery. Seriously. Jacquie, what a great idea! That would be awesome! You’ve certainly hit it on the nail! In addition to things the sleuth sees that we don’t, there are also those the sleuth hears that we don’t. I had one of those sneaking up on me recently. The murderer was a complete surprise and for once I scanned back and found that the only real clue was something along the lines “After their breakfast together at… she knew exactly where to look for the murderer and where to get proof.” Yet in the context the breakfast itself seemed commonplace; there was no special stress laid on it. It’s not often I get totally surprised by an ending but I don’t mind when that happens. There is nothing I hate more than figuring out who did it by chapter three and then having to struggle to keep interest enough to get to the end and find out I was right the whole time. This is why no matter how much I may love an author I never read more than two of their books in a row so I don’t get so used to their style that I can predict what can happen. Melissa, I sort of feel the same way as you do about struggling through the rest of the book. However, I seem to be wrong so much of the time that I keep reading and hope I was wrong. Which a lot of the time (even though I was absolutely sure I knew whodunnit) it turns out I didn’t! Often I don’t try to guess, I just enjoy the story as it unfolds. Sometimes I just get a feeling about the perpetrator, and once in a while I am right (and quite often I am not!). But I enjoy the journey the characters take me on, no matter what. Amy, I try to not guess, but that takes me back to the reason I don’t particularly care for 300 page books. I get very impatient! Doggone it, I wish that by page 250 I could just “enjoy the journey the characters take me on”! I agree with Amy I love the journey the author takes us on, I try to solve it, but I am not sad if I do not. I enjoy the story for the entertainment it gives me. Many times I can figure out who the murderer is before it is revealed, but there are occasions when I am surprised at who the culprit is. I think about what is said and who would be the most unlikely culprit. In the most recent cozy I read, I knew who the murderer was about two chapters before the end. I had my suspicions before that and was proved correct. I like to see if my deductions are correct when the culprit is revealed. Sometimes, I have to say to myself that I didn’t see that coming. Cheryl, aha >>> deductive reasoning! I’ll try this approach while finishing the Cozy I’m currently reading. I’ll think about the most unlikely culprit, and pin the tail on him/her. I remember years ago being totally surprised when one of my favorite authors at the time made the culprit one of the secondary characters in her series. I am guessing the author felt she wanted the culprit’s wife to pose a dating threat to the sleuth. I was so unhappy with the big reveal of the culprit that I dropped that author from my favorite authors list, so I don’t know if I was correct, or not. Glen D, thanks for mentioning Mignon F. Ballard‘s Miss Dimple series and Christopher Fowler‘s Bryant and May Peculiar Crimes Unit series as good examples of mystery series with great character development! Sometimes I think a character is a little “off” in a book. But, more times than not, I finish the book thinking, “I should have realized that”. I think a good author can string you along like that. I’m with you, Teressa: I think that no matter how we think we can figure it out before it’s over, an author can make sure that we can’t as we won’t get a critical clue till she or he reveals the culprit. In the cases where we’re (the readers) “set up”, I don’t bother with any more of that author’s books as they are playing a game that is one-sided. If an author plays “fair” with the reader, then, if they give us the clues they are working with and don’t insert a suspect or clues in at the end, then I’ll try to stick with the story. I always make the guess that the killer is the least likely character, both books and TV mysteries. I very seldom figure out who the culprit is. I enjoy reading so I don’t let it bother me. I hate to admit this ……on engrossing cozies I have been known to peek at the end of the book to see ‘who done it’ and how it ends and then just continue reading on to see how the story unfolds. I guess I should come clean, too. Yes, I admit it. Sometimes I just have to check out that ending, especially when the book (as PamB said) is engrossing. My daughter rolls her eyes when she finds out I “looked ahead a bit”–which is what I call it. LOL. I tell her she just doesn’t understand. (I also might “look ahead a bit” if the book is 300+ pages and I find myself getting bored!) My success rate for figuring out the culprit is 50-50. Sometimes I am so far off base with my guess that I just have to shake my head. I’m definitely not a fan of an author throwing in some random person during the last chapter or two and making him/her the culprit. That makes me crazy! The author should at least give the reader a shot at figuring things out. Great topic, Danna! Danna and Linda MH, I’m in good company! No more peeking for me…….just “looked ahead a bit” will be what I will be doing on those engrossing cozies. PamB, I’m with you >>> no more peeking! Looking ahead a bit sounds totally legit! I am able to solve a lot of them but the ones I don’t are really a surprise to me who actually did it!! I enjoy both because one makes me feel great like I could be a detective and the other way makes me feel like I have really been challenged during the read!! Kitty,it sounds like you are a whole lot better at solving them than I am! If you can do half of them, then I agree, you probably could be a detective! Sometimes when I watch a true crime show, I’m absolutely amazed at how they can come up with the culprits. I’m also amazed they think up some of the different avenues they take to find the killers. Danna: I think that a lot of your readers have a very good “common sense” gene as do you, in their makeup. Don’t kick yourself if you can’t figure it out when you aren’t supposed to. Like I told Teressa, if the author isn’t being fair, you won’t. There is nothing wrong with your guessing or sleuthing skills (or anyone elses), it is just that an author may want to be clever at your expense. Some of them (I won’t mention any names) don’t want readers to have the same skill sets that they do-so the reader isn’t given what they need to figure it out. Life is too short and there are too many good, talented and fun authors out there that want you to interact with their characters to bother with a book that “sabotages” the readers. Rob, I have trouble figuring out the culprit even when the author offers all sorts of good clues! Rob, I loved your last paragraph. That is so very true. Danna, you have me laughing here! I think that the only author who really provides all the clues is Agatha Christie. I’ve recently read a Josephine Tey book – The man in the Queue – and the killer really was a surprise. While the detective followed the story and found out about the characters and the events that led to the crime, the discovery was really out of the blue. But then I read that Tey does not fall into a regular category of writers. Then there are authors – I will not reveal their names here – where I know who is the murdered as soon as that character is introduced, before the plot starts to unravel. Still, as others commented – the pleasure of reading most of the books – the cozies, really – is to follow the characters and, if we are lucky, to learn about the surrounding background. Anne Perry is the great. Her Victorian England provides so much background of history and of the life that the “downstairs” but the really poor and wretched had to endure. I’ve read all the Thomas and Charlotte Pitts mystery and now started with William Monk series. Thank you, Danna, for this wonderful site that allows me to pick my books. Hanna, you’re right, Agatha Christie did provide the clues. When I would get to the end of one of her mysteries and see how logical her clues were, I would wonder why I couldn’t come up with the solutions. I don’t really try to solve the mystery, is that bad? I do have my suspects when I read my cozies and sometimes I am right and sometimes I am wrong. But, I just like the ride the stories take me on. I actually like to be surprised when the suspect is revealed, especially if it is totally out of the blue. Maybe I should try harder to solve the mystery before the end, but I don’t know? Would it ruin it for me? I just finished Flourless To Stop Him by Nancy J Parra and I didn’t guess till the end. Colleen, that’s pretty much what happens to me all of the time >>> until about the second to the last chapter when the author makes it pretty obvious, if not, tells us! In all of my books I make it a point to give the reader all of the information that they could need to solve the mystery. They might have to make an intuitive leap or two (just like my sleuth Dulcie Chambers) but it’s all there. I think it’s only fair, although I’m not above the odd red herring! I really like the mysteries when I am fooled at the end by who the murderer was. I feel the author did a good job at plotting the story. I do not like it though when the murderer comes out of left field at the end and you almost ask “who is that?” Then start thumbing back through the book to see where that character made an appearance if any. That does not happen very often though. When I do know who the culprit is, I get the vibe when a character is introduced in the story. This is due probably from reading a lot of mysteries and probably happens to other mystery readers too. You just get a “feel” for it. I am happy when I am wrong as I like it when the author fools me. This hasn’t been mentioned -even though I know who probably did it, I seldom know the full motive. So even though I knew who it was, I didn’t know why they did it so that does give enjoyment to the story. Sometimes it is quite surprising. Lynn T, I’m all for being fooled, since that’s what I usually am! If I have to thumb back through a book to find out who the culprit actually is (after the big reveal) I pretty much know that author isn’t for me! Thank goodness that doesn’t happen very often, or I’d be all out of Cozy Mystery authors! I totally agree…………there are two scenarios that really irritate me. As Danna just said……….. the culprit is so obscure you have to backtrack through the book to figure out just how he/she fits into the story. I’ve seen this happen on occasion with some of the most famous cozy authors. UGH! The other instance is when the mystery story is poorly plotted throughout the book. The author then takes the last chapter (or even two) to ‘explain’ the whole story. Second UGH! Usually the ‘whys’ can be explained in a paragraph. If it takes longer, the author hasn’t organized the story very well. I don’t mind a longer book as long as it is intriguing, engaging, and a page turner. I’m reading one right now that is close to 400 pages. This particular author always writes ‘longish’ books and I always love them. This is the eighth book I’ve read by her and, so far, all have been excellent! I can read a good, fast paced ‘long’ book much quicker than one that is ‘shorter’ but really slogs along, with too much extraneous unimportant detail. MJ, I hate to take credit for your first “UGH!” >>> Lynn T mentioned this dreaded scenario, and I agreed. MJ, UGH is right! If they pull the old “doggone it, who is that?” trick, I’m out of there. As for your second UGH >>> either the author is disorganized, or she/he has to deliver so many words/pages! As a reader, I’ve always enjoyed trying to solve the mystery, whether the mystery is a cozy or any other type of whodunit. I feel like I’m playing a game when I read a traditional mystery. The object of the game is to figure out whodunit. The players include, not just the characters in the book—murderer, victim, suspects, sleuth—but also the author and me, the reader. I like matching wits with an author who plays fair by giving me all the clues, but in the process is directing my attention elsewhere so that I miss the significance of the clue. Agatha Christie does this really well. The only time I ever figured out whodunit in her books is when I’d read several in a row and started to get a feel for how she hides clues in plain sight. Those occasional triumphs are great, but I like it better when the author has fooled me while playing fair. Because I enjoy this game so much, I play it now as the author of the Five-Ingredient Mysteries, each of which has five suspects and five key clues buried amid the red herrings. I’m always disappointed if I’ve figured out the murderer ahead of the reveal. As we say in TV, it means I’ve gotten ahead of the story. I love looking back and seeing how the author laid out the clues for me. And I totally agree with Maya re: Agatha Christie. I’ve read all of her books many times and marvel at how even when re-reading, she catches me by surprise. Yet the ending is always earned. I strive to emulate this as a writer, and revel in it as a reader. Ellen, congratulations on your new writing deal that will enable you to bring us books 3 & 4 in your Cajun Country Mystery Series! Absolutely terrific news for us >>> and you! Danna, I loved the first book in this series. So glad to hear there are more to come!!!! Thanks for the info. Hi Danna and everyone. I have been keeping up with posts, but so busy, I’ve not had time to add a comment for a while. I sometimes solve the mystery, but as several have already said, I enjoy the characters in series, their quirky or humble or extravagant homes, their families, friends, pets, even vehicles. Is there a tense scene where the mystery villain has cut a brake line or is lurking outside? My heart rate quickens. Are our sleuths extra burdened with their jobs or activities at home or are they able to chill and relax with a cup of java, tea, glass of wine, a bubble bath, perhaps? I exhale also. When I read, I am living vicariously through them for that time. It is such fun and a welcome escape from my everyday reality. (Not that I have any complaints : ) ) Let’s face it – cozies make us feel cozy! The mystery is the icing on the cake. Like some of the others here, I don’t even bother to try and work out who the villain is, most of the time. I read to relax, and trying to work things out ahead is too much like hard work. Lol! It’s been said before on here, but a good writer can pull you into their world. I like to just take it easy and enjoy that world, and the characters who either are old friends already, or are soon to be. Everybody’s different, and no way is wrong, but Danna, if I might suggest something without being rude? Maybe you’re trying a little too hard. You’re sure you’re right about who the villain is, and when you get it wrong, it makes you determined to be right the next time, so you jump in hard, and … you miss things. Then the circle starts all over again. Perhaps try and take it a little slower? Reserve judgement for a little longer before deciding? You may just find that overlooked extra clue that you need to be right this time. I must admit, though, that two of the most memorable mysteries I have ever read, have had ‘surprise endings’. One is the Christie classic ‘The Murder of Roger Ackroyd’, and the other was an obscure, vintage, American novel that I cannot remember the name of. It was told in the form of letters to the main character’s absent wife – who never actually appeared in the book at all – but guess who turned out to be the ‘master criminal’ that the narrator was trying to track down and who was hiring people to try and kill him…? It was ‘very’ well done, and I didn’t feel at all cheated by it. I must try and find out what it was. I want to re-read it now! Lol! Susan*, you’re right >>> I’m probably trying too hard. Sometimes when the author does the big reveal, I’m totally dumbfounded. Also, there have been cases when I thought the reasons for the culprit killing someone were so far-fetched that I was almost happy I didn’t know whodunnit. I loved, loved, loved The Murder of Roger Ackroyd! The culprit totally surprised me, and it made so much doggone sense! I did not see that one coming! Agatha Christie’s is the Grande Dame of Cozy Mysteries for a reason! When reading mysteries I am never able to solve who did the deed. Although in one book (JoAnna Carl’s Chocolate Snowman Murders) I was able to solve the murder before I finished the book. Although in one book JoAnna Carl’s Chocolate Snowman Murders I was able to solve the murder before I finished the book. There was one particular item that was given to a particular patron in the book and they made a point about it and it ended up next to the body so when you read this book if you pay attention to the particular item it was only one of a kind item. that was given out. Alfred, you make a very good point about this book. Yes!!! As soon as someone complimented her on that item, quite early on, as I recall, it was all over — because you know nobody but the murderer (and the victim) could have seen it!!! the book. Reading is so much fun. Jan, hmmm… Have I mentioned that I’m re-reading Leslie Meier’s holiday Cozies during their appropriate seasons, and sometimes wonder if I really read these in the 1990s! I am another person that doesn’t really try to solve the mystery before the end. In fact, if I figure it out too early, I may lose interest in the story. I enjoy being surprised. (Also, I would never ever peek at the ending–unless the book was so bad that I wasn’t going to finish it. And sometimes in that case I don’t care enough to look). Carol, you bring up a good point! I think my OCD takes over when I’m reading a bad Cozy. I absolutely have got to see whodunnit, even when I know I will not finish the book. So, I guess that really, my 50 page rule really means 50 pages plus the last chapter. I think a lot of the time I just sink into the story and don’t work too hard to solve the crime. If I do work at it, I usually narrow it down to 2 suspects, one of whom turns out to be the killer. I studied Agatha Christie, including documentaries and books about her and have found I am able to pick out the villain in most of her stories I’ve read since. Each author has their own “tricks”. Agatha likes dead people who are not really dead, twins, and making the villain obvious, ruling him out and then revealing him with some sly piece of info at the end. Her first clue is almost always presented in the first chapter and sometimes even before the murder occurs. This is the most frustrating part of reading mysteries to me because most times I am shocked by who the real culprit is. Then, as the heroine reveals how she figured it out I realize the clues I missed that should have made me realize who did it. Cheryl, I do the exact same thing! When the sleuth goes through the list I can remember when she picked up the clues, and then it hits me that I should ‘a/could ‘a known!